I know it's not officially summer yet, let alone spring. But seasons are starting to change which always makes me want to go out and do some shopping to update my wardrobe. Since the fashion industry is always at least a season ahead we are already seeing great pieces for summer out and about, which got my onto shorts - that, and I wouldn't mind getting to wear them soon! There was a time in my life where shorts did not exist in my wardrobe. I refused to wear them for many years, ok most of my 20's actually. I think it was because I was at that age where everyone was wearing really short shorts and I couldn't stand wearing them, I felt ridiculous. They were tight, and always riding up even more - if that was even possible. I've started to add shorts back into my wardrobe the last few years, and as long as they fit right, I actually quite like them. There are so many fun patterns and colors out there this season I thought I would round up a few of my favorite. 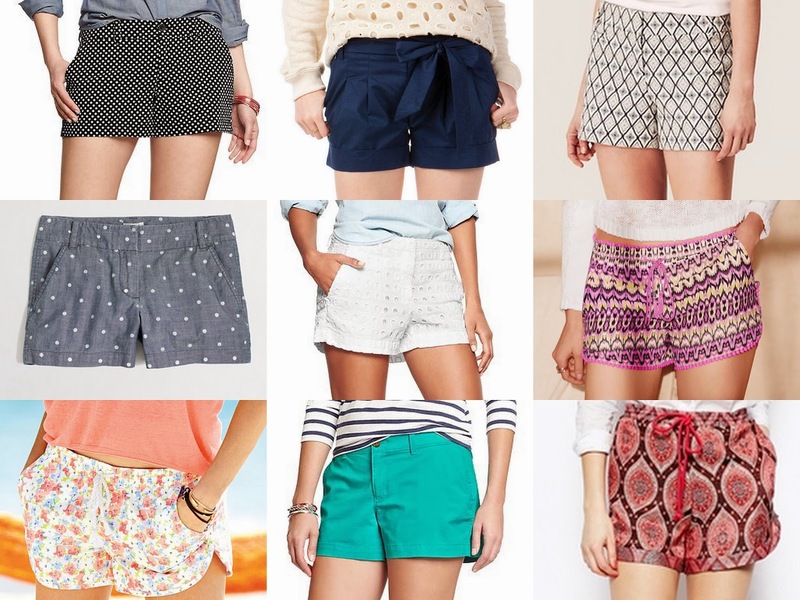 I would love to add the white eyelet pair from Gap and the patterned track shorts from Victoria's Secret to my collection. I always find that Old Navy is a great place to find fun colors and patterns for cheap, which is good if you aren't 100% sold on loving shorts. How about you, will you be wearing shorts this summer? I'm with you on the love/hate relationship with shorts. I'm very self-conscious about my thighs, so I have to find the right pair that aren't too tight or short. I love Old Navy for their shorts (and jeans!) so that's where I do a majority of my shopping for them. it has been a while since I have wore shorts, I actually do not own any. I have been considering getting some shorts for this summer. I like the patterns of the shorts you shared.